Rawalpindi beat Karachi Whites by six runs to qualify for the National T20 Cup final on Monday. Karachi Whites had won the toss and chose to field first. Rawalpindi scored 157-9 in their 20 overs as Naved Malik scored 90 runs off 54 deliveries with the help of nine boundaries and five maximums. Saud Shakeel made 25 runs while Hammad Azam scored 18. Raza Hasan, Rahat Ali and Mohammad Sami took three wickets each for Karachi Whites. The Whites fell six runs short of their target in the chase as they could manage 151-4 in their 20 overs. Fawad Alam played an unbeaten knock of 52 off 37 balls with the help of two fours and a six. Awais Zia scored 40 runs while Khurram Manzoor and Shoaib Malik made 23 runs each. Hammad Azam took two wickets for Rawalpindi. 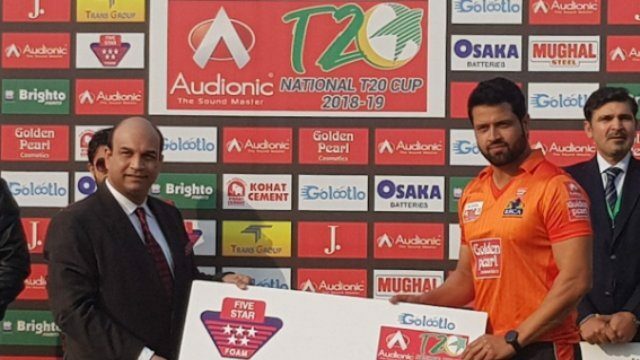 Naved Malik was the player of the match.